Disclaimer: I received this meal for four people from Bhajis in exchange for an honest review. All of my views are my own and are truly unbiased. The pictures of the food featured in this review are the actual food we were given. 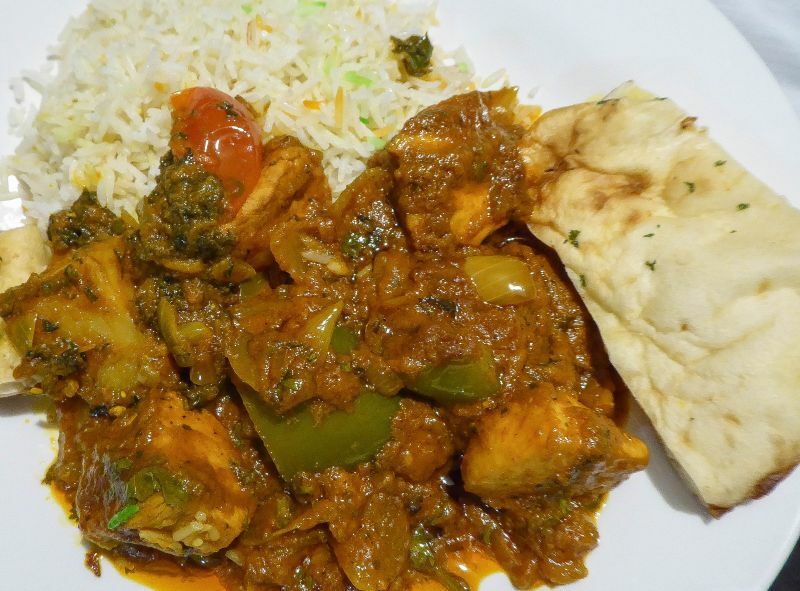 Ok, it is quite unusual for me to review a takeaway or fast food restaurant; I mostly review fine dining establishments. 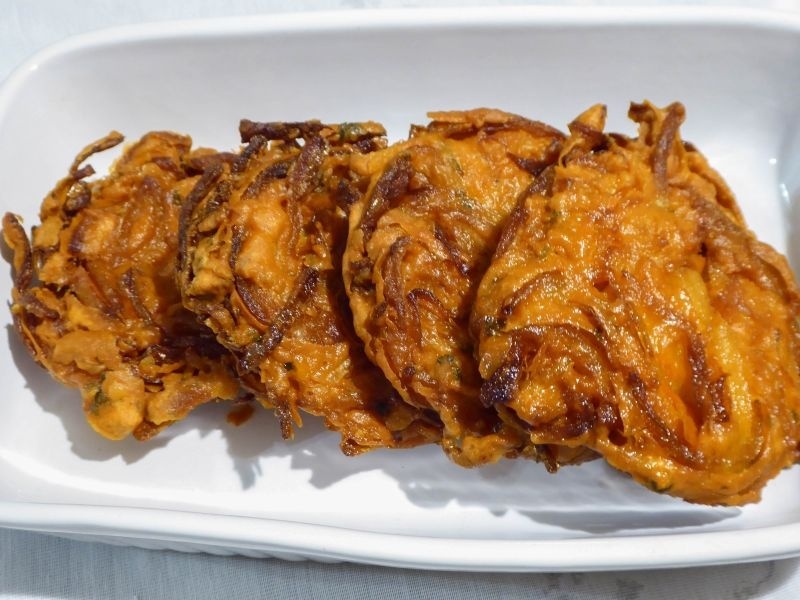 However, when I was visiting my favorite local Indian restaurant in Farnham Common, England – The Nazma, I got to talking with its owner and he suggested his other takeaway restaurant Bhajis just down the road. Sure, why not. I do love a good onion bhaji, and it isn’t something I can get in California for some reason. Saturday night, a group of four friends and I ordered our takeaway to eat at home. The ordering process was pretty painless and efficient, and we were given the time to come pick up our food. 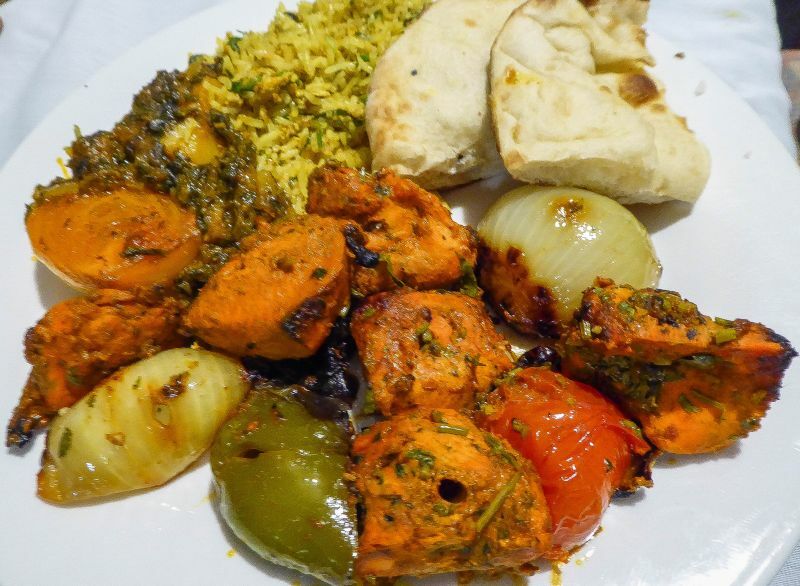 Unfortunately, the location of Bhaji’s makes parking a bit tricky, but we managed to find a spot and went in. Our food wasn’t quite ready as they make every single dish fresh and to order. We had a small wait, but as we aren’t expecting fast food it wasn’t a problem. We did notice how spotlessly clean the place was, and how you could see into the kitchen as the chefs prepare your food. I always worry when places are a little grubby on the outside and you can’t see into the kitchen. 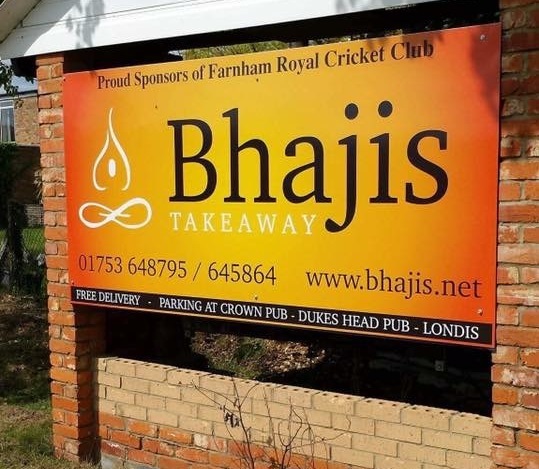 You have none of that worry at Bhajis. When we got the food home it was a feast. You would have thought we were feeding an army and not just four people. The food looked and smelled amazing. I was truly salivating as I was plating it up and pleased with just how nice of a job they did with the presentation of the food. We were so surprised to not only get Pompadoms, but really delicious chutneys and sides to go with them. It was oh so good. We didn’t know what the name of the yellow dip was, but our group was raving and commenting that they like it better than the green! I have to start with the Onion Bhaji’s which were my pick for the starter. They were light and crispy, with perfect seasoning. (I think they were better quality than the ones I had at the Nazma if I am really honest..shhhh). 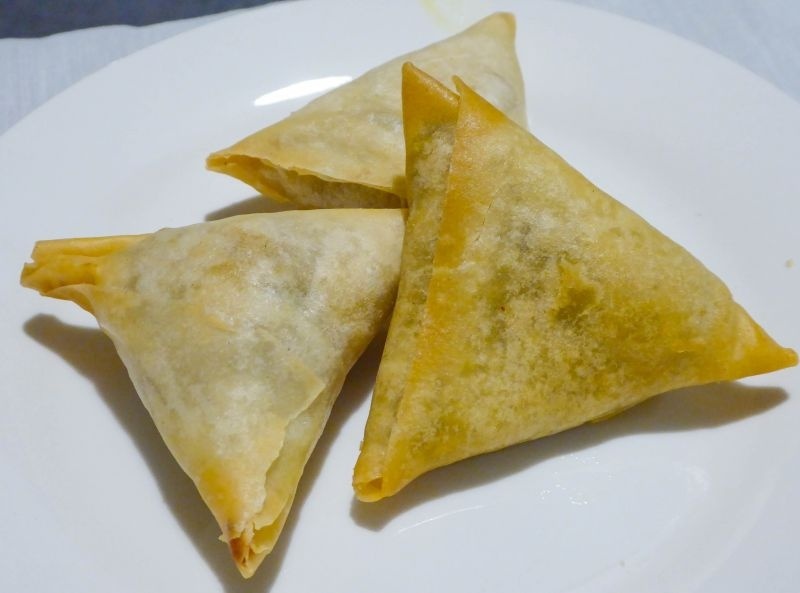 Next up were the samosas. We chose these because they are a staple. These were filled with spiced potato and vegetables. Perfectly crispy and not at all soggy these definitely got the thumbs up from all of us! 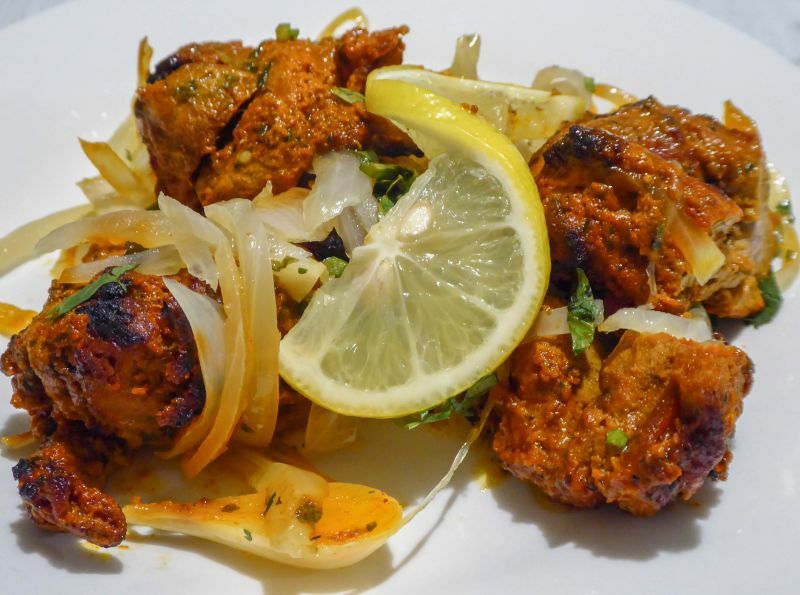 Our next starter was chicken tikka. It looked so nice with its little twist of lemon on top and all of the sliced onions. I thought the taste was perfect. It was not too spicy but had lots of flavors. The chicken was cooked beautifully.. tender and juicy. For our main courses, we each chose something different and we shared. 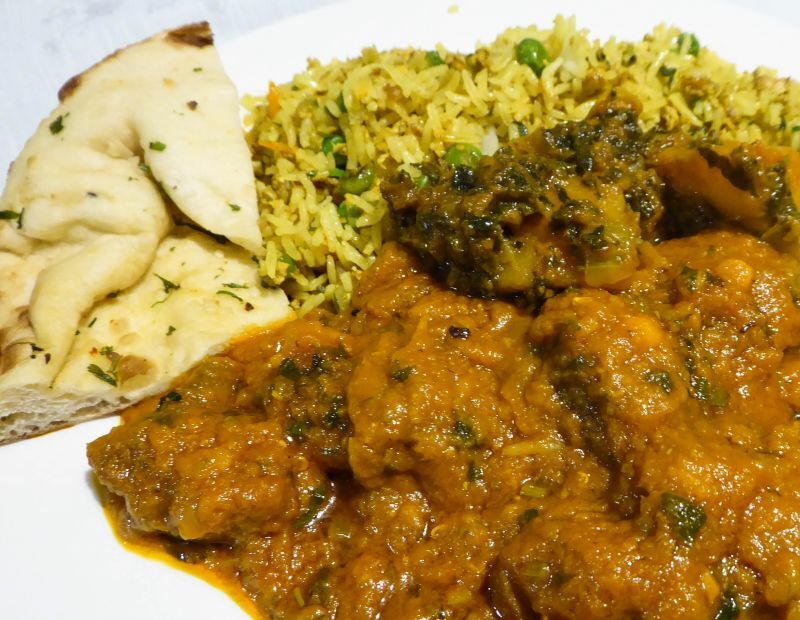 We ordered the following: Lamb/Meat Curry, Chicken Dopiaza, Chicken Tika Masala, and Butter Chicken. These were accompanied by various types of Naan bread and Mixed Byriani Rice. Even though we each ordered a dish for ourselves, we ended up eating the meal family style trying a little bit of each other’s food. Some of our group like really spicy Indian food while others (ok I’ll admit it was me) like it more on the mild side. Every single dish was great. Packed with flavor and delicious. I think my only complaint really if there was one, was that my chicken was a tad bit overcooked. Frequent readers of this blog will know that is a really big thing in my book. I want to clarify this here, it wasn’t killed to be inedible, just cooked more than I prefer. My dish was still tasty and I happily ate it. As we passed around our dishes, we all agreed how much we liked the Lamb/Meat Curry. You might wonder why it is written that way. It is because British Law is very strict on what a restaurant can label Lamb and Mutton and everything in between. To save themselves from ever crossing that line they just say “Meat”. Coming away from our takeaway I have to say how impressed I was with every single dish. There was a lot of food, and it was all hot and served beautifully. I know full Indian restaurants that don’t do as good of a job! My local in California sure doesn’t! 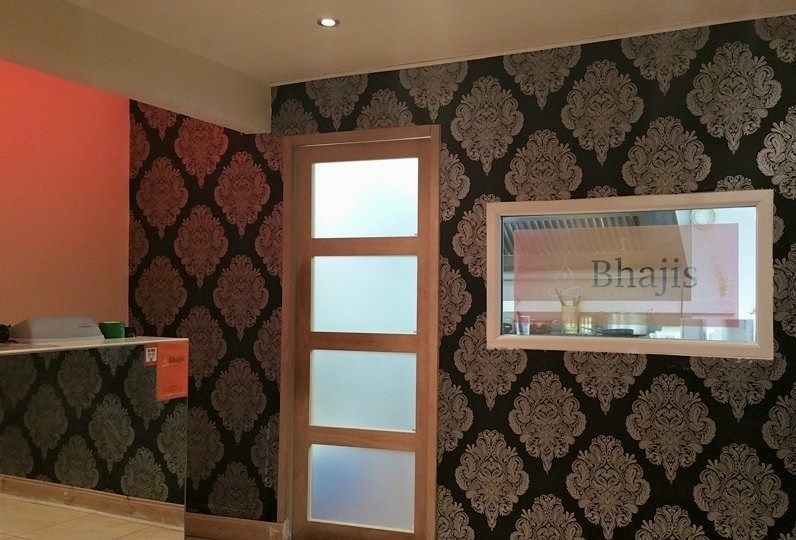 I’d highly recommend Bhajis Takeaway, and if you want a sit-down meal its big brother The Nazma in Farnham Common. Both are high quality, great service, and delicious food. This looks beyond tasty! And of course I’ve gone and read it in the morning before breakfast! I’ll definitely have to check Bhaji’s out when I get back to the UK! I was one of the original party, and I live in Farnham Royal. I have just been back for a meal and can confirm that it wasn’t a fluke nor a function of the circumstances that the original meal was so good. I went back “incognito” this evening for a johnny-no-mates meal for one and it was as good as the original meal. 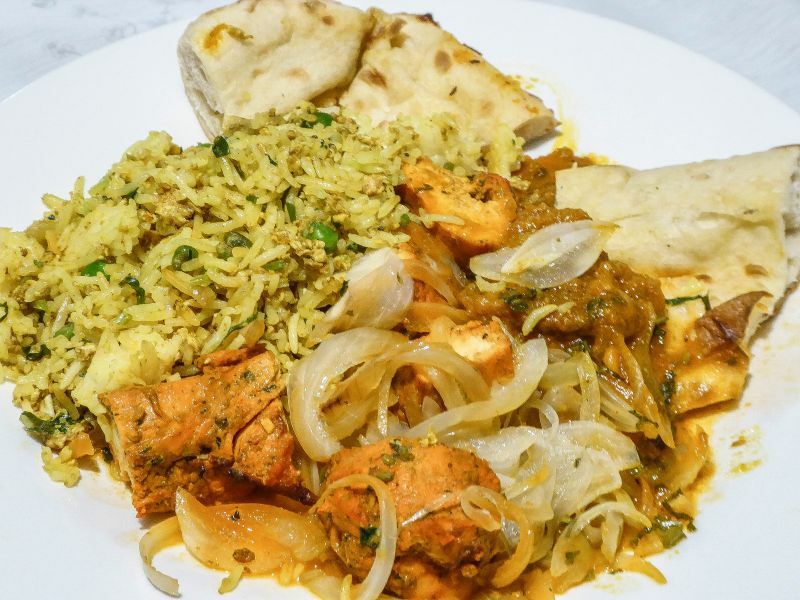 I had Onion Bahjee starter, Meat (Sheep) Dhansak with Pilau rice, Sag Aloo, Sag Paneer and Peshwari Naan. 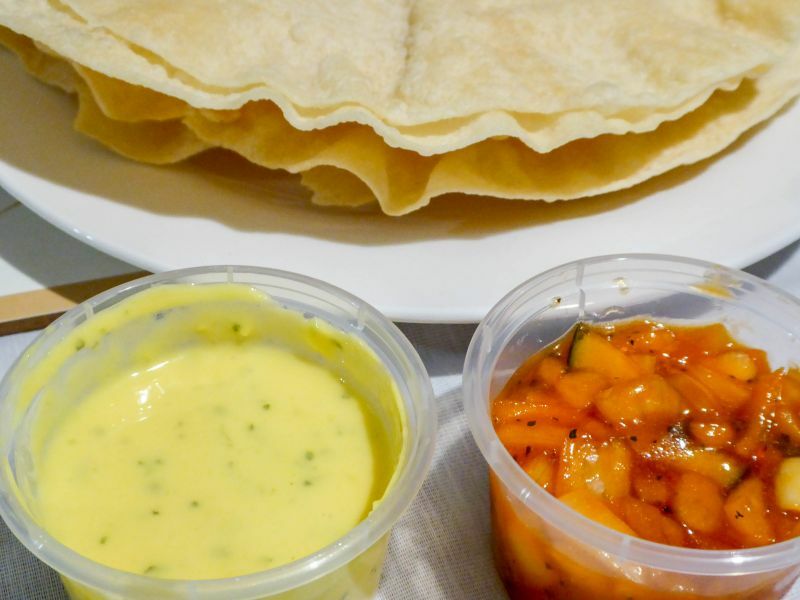 I received 2 complimentary poppadoms with minty yogurt dip and mango chutney dip. I had a short wait as they were busy taking orders (it was 7 PM on a Saturday evening). I live close enough to walk round, but if you drive, park at the Duke’s Head Pub across the road and use the Zebra crossing. I’ll be back, but not too soon as I still have half the meal in the freezer to enjoy another day! I’m glad to hear that it was just as good in a blind taste test!!! Can’t wait to go back!